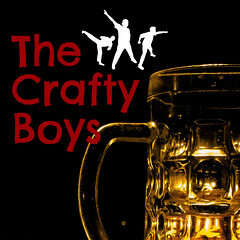 This is The Crafty Boys! This podcast are a bunch of old friends who like to sit around, talk about Canadian man stuff, and drink craft beer. We have been meeting up like this for years but it hasn't been streamed live to the Internet until now. Listen to our brilliance! Marvel at our intelligence! Laugh at us because you know we're full of beans. Join us every Wednesday night and drink along as we discover what it is to be a Canadian Crafty Boy.